Please Note: The Geovision GV-SNVR0811 is no longer manufactured. Please refer to the Geovision NVR page for a replacement. The Geovision GV-SNVR0811 is a standalone network video recorder capable of supporting up to 8 Geovision IP cameras. Third-party IP cameras are also supported via ONVIF and RTSP. The Geovision GV-SNVR0811 records to an internal hard drive in up to 4K Resolution (3840 x 2160) on all 8 channels using the H.265 or H.264 video compression. Instead of using a separate POE switch or injector to power the cameras, the GV-SNVR0811 has 8 POE 802.3AT ports built-in to power the cameras directly from the NVR. In addition to POE ports, it also features a WAN port to connect to the local network. PTZ cameras can be controlled using the onscreen controls or with the optional GV-Joystick V2. 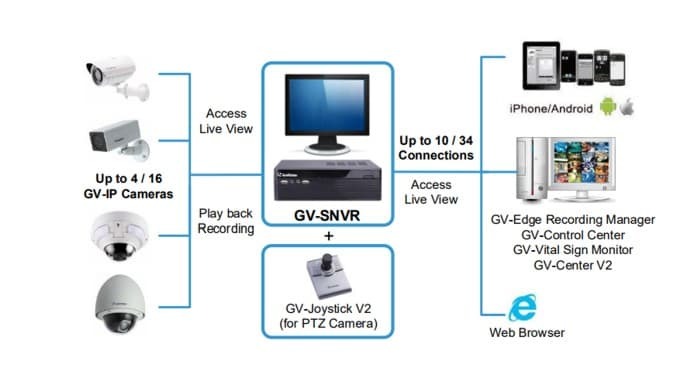 The Geovision GV-SNVR0811 can be remotely accessed from a number of devices including Windows PC, iPhone/iPad, and Android mobile devices. 2. The GV-SNVR0811 supports the recording bandwidth of up to 80 Mbps only. 4. GV-SNVR0811 also supports EVS-ABD1300 / ABL1300 / ADR1300 and UVS-ABD1300 / ABL1300 / ADR1300.